"Fatima is the joy of my heart." SIIJLA invites you to please join us to commemorate the Wafaat of Sayyeda Fatima (A.S.) on Saturday, February 9, 2019. The program will begin at 6:00 pm with evening prayers; the speaker will be Syed Mahdi Qazwini. 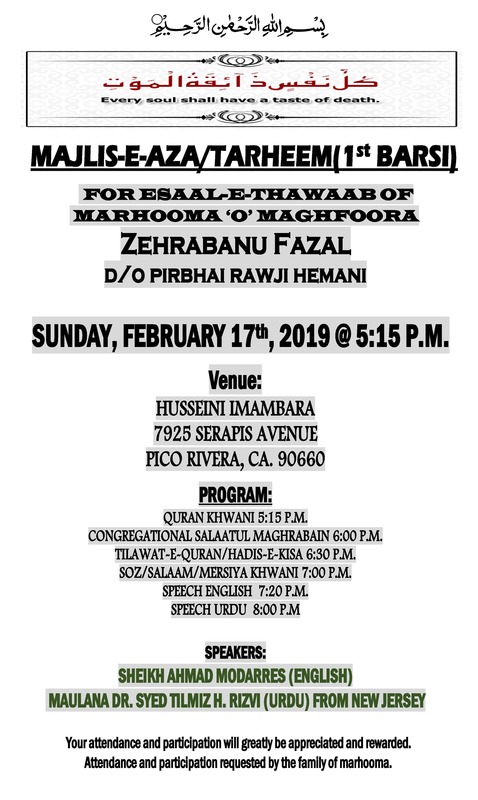 In addition, the Fazal family requests your presence at the program for the one year death anniversary of Marhuma Zehrabanu Fazal. The majlis will occur on Sunday, February 17, 2019 at 5:15PM. Please find details in the flier below. Anyone wishing to participate in the recitation of dua/poetry/Munajat during these upcoming programs, please contact Br. Jamil Jaffer at jamil.jaffer@gmail.com. If you would like to sponsor any upcoming events, please contact the Chairlady, Sister Yasmin Jivraj, at yasminjivraj@gmail.com.